I recently saw a movie that left me very dissatisfied. It had big name stars, and they did their usual good work, but I wasn’t engaged. Why didn’t the story work for me? Because the heroine was a wimp. “Why doesn’t she just tell him off?” my cousin kept asking. I know there are women like this character in real life, but they don’t make good story leads. They are too passive and their victories are so small that they seem without value because they scarcely move the story forward. I want to watch or read about someone who fights through with grit and bravery no matter how much she’s shaking in her stilettos. It’s not that I’m against subtlety and small realizations. Story don’t always have to be big aha! moments. However it does have to be about stepping forward and doing something. One of the great strengths of current romantic suspense is strong heroines. Oh, they may start off being knocked sideways by the calamity they’ve fallen into, but they don’t stay there. They rise to the occasion, facing the danger, going toe to toe with the bad guy. They are intelligent women, and they behave rationally (going down to the dark cellar with only a wavering candle excepted). I want heroines I can respect, women I can emulate. Sure, I probably don’t have to one up a murderer but I do have to figure out how to face my more mundane life crises. If she can face her fictional threats, I can face my real life ones. After all, mine don’t carry guns and wield knives. Who are your favorite heroines? 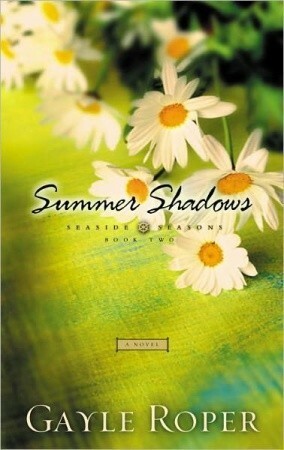 One of my favorites is Abby in my Summer Shadows. 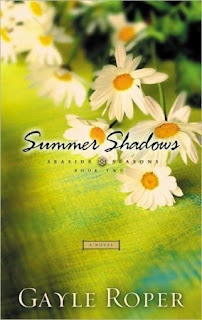 Enter to win a copy of Summer Shadows so you can meet Abby, a gutsy, funny lady I know you’ll respect and appreciate. Storytellers have used symbolism since they gathered around the campfire to thrill listeners with tales of courage. They used figurative language to create visuals that frightened and impressed the listener. We suspense writers haven’t changed. We’re still using a dark and stormy night to set stories that will keep readers on the edge of their seats. Biting their fingernails. Reaching for the ball bat under their bed. And reading with one eye open. Ever wonder how a suspense writer uses symbolism to create the perfect setting? I’m going to let you in on a few tricks of the trade. We use hard consonants, like b, p, t, d, k, and g in which the consonant sound stops the flow of air. Sort of how we writers want to stop the reader’s breath. Think brisk, probe, terse, death, kill, or gun. We use colors to move you into a suspenseful mode or pull you out. Red is a warm color that causes strong emotions. From warm and comforting to anger and hostility. Blue carries a range of emotions from calmness to serenity. Blue can also mean sadness. Green symbolizes nature and growth. The color has a calming affect. It can mean wealth, greed, and jealousy. Yellow can be a color of frustration. More tempers are lost in yellow rooms, and babies tend to cry more in yellow rooms. Purple is often associated with royalty, wealth, wisdom, and spirituality. Sometimes it symbolizes arrogance. Brown is a natural color that invokes a down to earth feeling. However, for a person who is isolated on a farm and feels imprisoned, the color brown may be depressing. Pink is a romance color. It suggests love, femininity, calmness. Orange mixes red and yellow to create a warm affect. It means excitement and enthusiasm. White signifies purity and innocence. It can also mean spaciousness or a sterile environment. Black means evil, power, death, or mourning. In the fashion world, it’s used to create a slimming affect, even sophistication. Gray is a mix of black and white, life and death—gray clouds, a gray matter. We use numbers: One indicates wholeness. Three represents the Holy Trinity. Six means incompleteness, as in 666. Seven indicates completeness and twelve is the number of fulfilled judgment, as in twelve months in a year and twelve jurors deciding the fate of someone accused of breaking the law. We writers also use details of the environment to build suspense: a ticking clock, a dripping faucet, nature’s fury, or other tangible items to create an edgy feeling. A horror writer employs the colors of red and black, shadows, repugnant smells, and clanging sounds. Suspense writers use whatever we can find to create mood for our novels. All carefully placed to keep you turning pages and reaching for the next novel and the next. Happy on-the-edge-of-your-seat reading! If you'd like to win a copy of DiAnn's novel, THE CHASE, just leave a comment, along with your contact information! 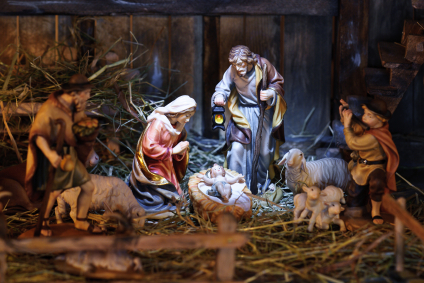 I thought this might be a good time to share the REAL Christmas story with our readers. There are groups of people who would like to remove Christ from Christmas, as well as from our nation. This is a time when those who love God need to stand up and say, “No.” America was founded with the idea that its citizens would enjoy freedom of religion. Not freedom “from” religion. In keeping with the “reason for the season,” here is the Christmas story. The beginning of redemption, forgiveness, and grace – extended to all men and women. Even those who seek to steal our freedoms and turn our nation away from God. 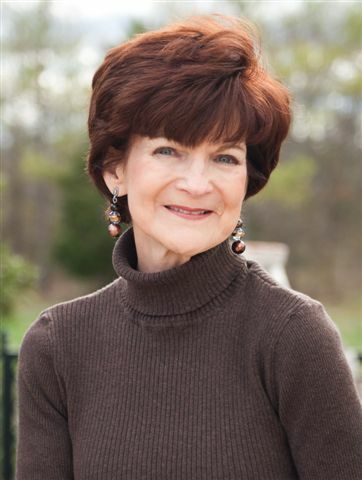 Today Suspense Sisters welcomes Award-winning Mystery Author Lorena McCourtney. Lorena is giving away a copy of her book, DYING TO READ. If you'd like to be entered in the drawing, please leave a comment and you must include your contact information. I met Lorena (Elizabeth here) when I lived in Oregon. I hadn't yet sold my first novel to a publisher and was writing book reviews. Lorena contacted me to review her mystery, Stranded. We were both thrilled and surprised to have another Christian fiction writer living in the same small town in Oregon. So we started getting together for lunch once in a while. Over the years, Lorena has been a great encouragement and friend to me, and I'm so blessed that God brought us together. We're honored to have her with us today. McCourtney: I still write full time, more or less. Although I’m not quite as full time as when I was younger. I’ve been a writer for a lot of years now, but it wasn’t what I started out to be. I worked my way through college with a job in a seed laboratory, and earned a BS degree in agriculture. Which probably doesn’t often lead to a career as a romance and mystery writer! At the time what I wanted was a big ranch, or maybe do some writing on agricultural subjects. Unfortunately, I turned out to be less than thrilled writing about hog raising and making sausage, which was what they wanted at the meat-packing company where I got my first job out of college. I then worked at various office jobs until I quit to be a full-time Mom and write children’s stories, and eventually moved on to romances and mysteries. McCourtney: I’ve had 42 books published, and sometimes I still feel like an imposter. Sometimes at the beginning of a new book, I feel as if there’s no way I can do this. 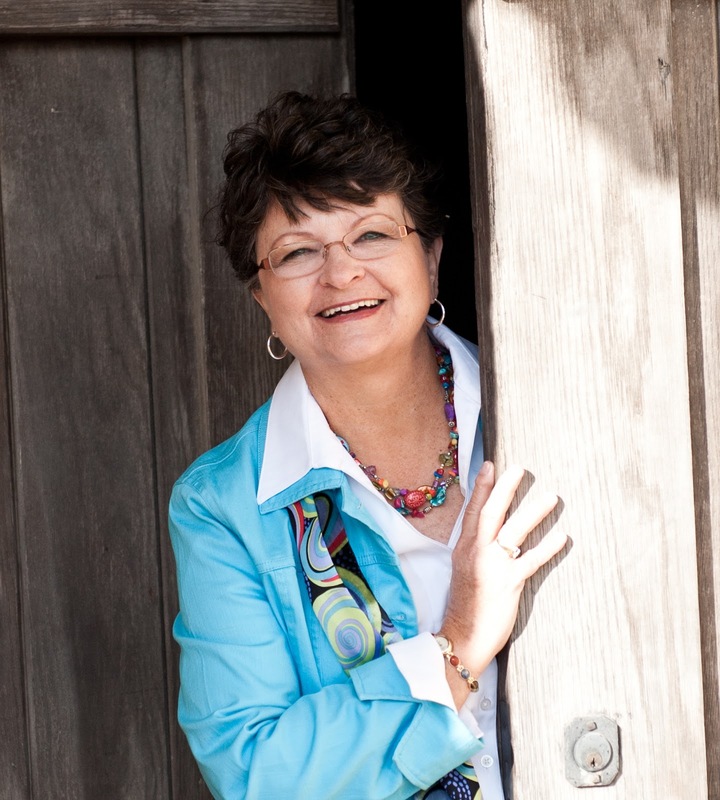 A “real author” should know exactly what to do – and I don’t! So I guess I’m still waiting for the “real author” moment. S.S: Why mystery? Do you write in any other genres? If so, what? McCourtney: I started out, when I left magazine-length writing for both children and the womens’ market, doing mass-market romances. I think I did 24 of them. 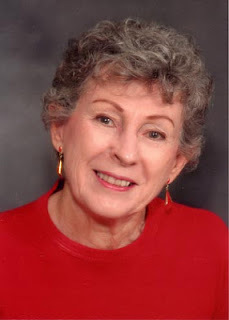 When I decided to switch to strictly Christian fiction, I still wrote romances. But in one of them I tossed in a murder and a mystery, and I thought – hey, I like this. So after a couple more romances, I changed to Christian mysteries and that’s what I’ve been doing ever since. I like the more complicated twists and turns. Sometimes I don’t even know who the killer is myself when I start out, or sometimes the killer changes halfway through a book. So that’s fun. Mysteries do take a fair amount of research, especially, for me, on police procedure and legal details. And I sometimes wonder if there’s some Big Brother out there suspicious of why I’m looking up how to embezzle a fortune or build an explosive device. McCourtney: Faith is an integral part of my writing now. I want my writing to serve the Lord, and I think that means putting my beliefs into the story. I see reviews of my books occasionally that say there’s too much “religion” in some of them, but my own feeling is that if I haven’t put enough of a faith-based foundation in my characters and plot to bring some complaints, then I probably haven’t put enough in. But I do want to keep from sounding preachy or holier-than-thou. I want the faith to flow out of the characters themselves. 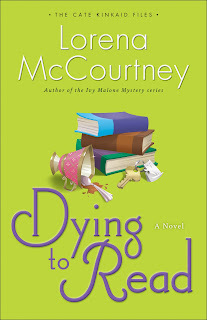 McCourtney: My latest release is“Dying to Read,” Book #1 in the Cate Kinkaid Files series from Revell. Cate, desperate for a job, goes to work as an assistant private investigator in her Uncle Joe’s Belmont Investigations business. Her first assignment is supposed to be quick and easy, no danger or mayhem, definitely no murder. Instead, she soon finds herself up to her elbows in Whodunit ladies, a paint-blobbed hunk, a deaf white cat – and killers. McCourtney: I’d been thinking a lot about so many people out of work. Even people with good education and experience may not be able to find a job, and my Cate is one of them. She first thinks of working as an assistant private investigator as strictly temporary, but the Lord often has different plans than we do. S.S: How do you come up with such interesting and unique characters? McCourtney: The world is full of interesting and unique people! I never use a character based exactly on a real person, but I do like to take bits and pieces of real people and meld them into a character for a story. Or I sometimes pluck out a little bit of myself to put in a character. This was especially true in my Ivy Malone character, the woman who feels she has aged into invisibility. A definite part of me! I like both real people and book characters who are on the quirky side, so that’s the way some of mine are too. McCourtney: I often tend to use the theme that God is in control. He may not take care of things exactly the way we’d prefer, or the style to which we’d like to become accustomed, but he will never abandon us. He’s always there. McCourtney: My main character, Cate Kinkaid, of course! I like her because she gets herself into strange situations, but she’s fun and resourceful, never a quitter. 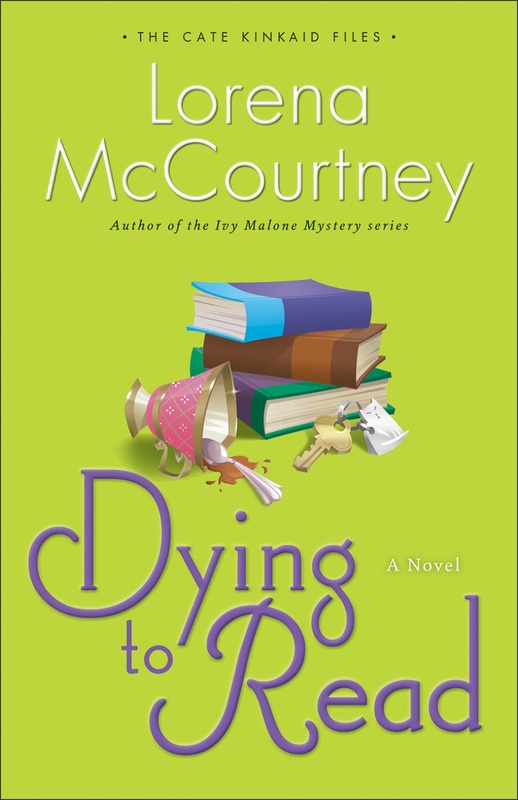 McCourtney: “Dolled Up to Die,” Book #2 in the Cate Kinkaid Files is already written and is scheduled for release sometime in mid-2013. So right now I’m working on Book #3 in the series, title not decided on yet. McCourtney: One item has nothing to do with writing. I’ve long wanted to climb Ayers Rock in Australia (though I think it may have a different name now). Why? Good question. Especially since a recent fall off a ladder reminded me I’m not great in the climbing department. But I’d still like to do it. Another is that I’ve long had a futuristic story simmering in the back of my head. It’s way out of my usual brand of writing in romance or mystery, so maybe no one would ever read it if I did write it. But it keeps simmering. Closer than that, however, on the “list” is doing another book in the Ivy Malone Mysteries series that readers keep clamoring for. Or just put my name in a search engine such as Google, and you can never tell what might show up! Thank you for joining us today, Lorena! I’ve been writing on and off as long as I can remember—articles, poems, short stories. You name it. I remember my mother wanted to send my stories to a publisher. Does that give you an idea about how long? Over the years I considered writing for publication but never pursued it. I couldn’t find much direction until I joined American Christian Fiction Writers. Back then it was called American Christian Romance Writers. I joined in 2001 and immediately hooked up with a critique group within the organization. We had to submit a chapter a week and from that group, I learned to write fiction. Today every person in my original critique group is published. This is sort of a trick question because as much writing as I do, it could be considered full time—but I write really fast, and have marathon weekends and evenings to make up the word count. My full time job is home schooling my three boys. Believe me, that takes up a chunk of my time. Before I stayed home to write and home school, though, I worked in corporate America. I sold high-level software and traveled around the country to meet with prospects. My editor, JoAnne Simmons, emailed me to offer a contract for my story, Seasons of Love. I remember running up the stairs to tell my daughter, but I stopped halfway and ran back down to reply to JoAnne first. Then I ran up the stairs again and shared the news with my daughter. That was a grand feeling and I’m sure all authors hold onto that moment. All my friends and family have been huge supporters of my dream, even before I began to pursue it. But my husband has been the most supportive because he has to put up with me writing, or living in another world, as he puts it. I’ve written romance for Heartsong Presents but even those usually have a measure of suspense. I’ve written a cozy mystery, The Camera Never lies, which I loved writing. That was my first cozy to write and I find that genre to be a lot of fun. Mostly I love suspense because the tension is much greater. It keeps me reading and writing. My faith is a huge part of my writing. It’s why I write. I believe that God gave me the desire to write and he fulfilled that dream. I often think how blessed I am to be doing something I love so much. God has been good to me. In every story I write, I pray through the writing that God will inspire the story, put His message in the way He wants it. I’ve been surprised sometimes at what spiritual message surfaces. It’s my biggest goal to make sure I include a spiritual nugget in every story. I was excited when I came across the premise for this story. I loved every minute of writing it, and this is one of those stories where the spiritual message surprised me. My hero has failed at a couple of dangerous jobs already. Now he’s a test pilot and decides to try his hand at recovering a Learjet from Belize. His escape includes facing men with Uzi’s and then he finds a kidnapped woman on the plane. Not just any woman, but the daughter of a Colombian drug lord. 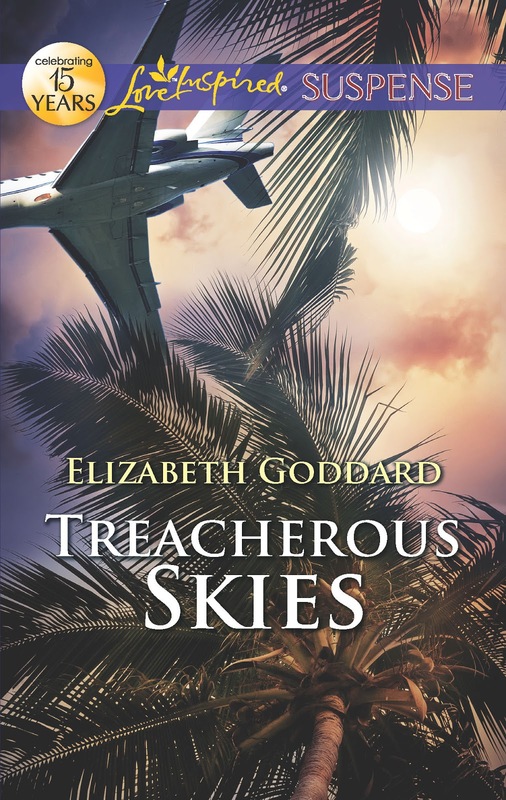 Her father’s enemy wants his plane back and his hostage, and he’ll stop at nothing to get them back. I came across the story of a real Learjet repo man and read about some of his dangerous adventures in retrieving luxury jets and yachts from South American drug lords, presidents of third world countries, and other unscrupulous groups. First I want them to have an intense ride, a powerful emotional experience while reading Treacherous Skies. Then I want to encourage them that our past doesn’t have to define our future. I just turned in the edits for the second story in this series. Riptide is Jake’s story—he’s the brother of my hero in Treacherous Skies. I’m also writing the third story in this collection with a working title of Striking Distance. 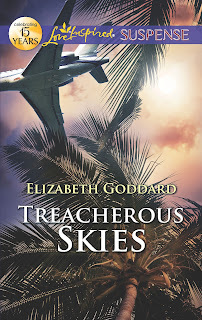 Here’s another chance to win a copy of TREACHEROUS SKIES. Leave a comment, answering what you’d love to see in upcoming romantic suspense novels and we’ll draw one name. But you MUST leave your contact information.